When Sarah and I had our children, we were somewhat lucky in that a lot of our friends and family were having children around the same time. There were several different couples that all had children within two or three years of each other. Because of that, and because many of our friends and family are frugally minded, many of our family events and gatherings of friends turned into swap meets for children’s clothing and other items. We’d bring a bag or two of clothes and leave with a diaper box or two of more appropriately sized items. For example, today my youngest son is wearing a pair of pants that was worn by his older brother, then by two of his older cousins. In the near future, it will be passed on to another of his cousins. If you have family or friends with children anywhere close to the age of your own children, there’s no reason not to suggest a clothing swap when the children outgrow their clothes. This is particularly true if you have a relative with children that are staggered in age in parallel to your own. For example, the cousin I mentioned above has a child that’s a year younger than our oldest, another a year younger than our middle child, and yet another a year younger than our youngest child (hi, Kim!). I don’t even want to guess how many clothes we’ve swapped back and forth at this point, but it’s been quite a lot. All of this has saved us a lot of money. 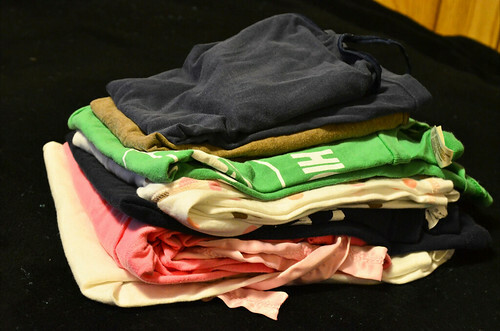 I wanted to try to estimate exactly how much swapping clothes, using hand-me-downs, and buying clothes from yard sales and secondhand shops has saved us over the years. So, I’m going to make some estimates, and I’ll walk you through the reasoning behind them. Let’s say that for each children’s size – newborn, 3 months, 6 months, 12 months, 18 months, 24 months, 2T, 3T, 4T, and 5T – we need to have 12 outfits. That’s probably a low number given the messiness of children (dirty shirts, ruined pants, mud all over the place requiring an emergency change of clothes, etc. ), but we’ll go with it. Let’s also say that a new outfit at the store costs $10 on average. You can get new outfits at some stores for less, and you can certainly pay far more than that, but we’ll stick with $10. So, if you bought all of the clothes for three children new, you would spend $3,600 on children’s clothes. Now, let’s look at some simple cost-cutting tactics. Let’s say that you are able to hand down 75% of the clothes from an older sibling to a younger one at that age. That means that we don’t have to buy nine of the outfits for each younger child, so we would only need a total of 18 outfits at each size. You would spend $1,800 on children’s clothes, saving half of your money just by handing down clothes. Let’s say that you were also lucky enough to get 75% of the clothes for your oldest child handed down to you by a friend. That means you’ll only have to buy a total of 9 outfits at each size. You would then only spend $900 on children’s clothes, saving $2,700 over buying new outfits. Let’s also say that you were able to buy 6 of those 9 outfits at a yard sale, paying $1 each per outfit. That means you’re only spending $36 at each size level, or a total of $360 on children’s clothes, and saving $3,240. That’s a lot of savings. If you have multiple children, handing down clothes will save you a lot of money. Even if you have one child, getting hand-me-downs from a friend or relative then passing those clothes on when your child outgrows them can save you some real cash, too.